No matter the size of your team, few things will have a bigger impact on your performance than getting your people to buy into your ideas, your cause, and to believe what matters. Best-selling authors of The Carrot Principle and The Orange Revolution, Adrian Gostick and Chester Elton’s new book All In answers one of the most overlooked leadership questions of the day: Why are some leaders able to get their employees to commit wholeheartedly to their culture and give that extra push that leads to outstanding results? As with their previous works, a huge (in this case, 300,000 person) study led to a groundbreaking finding: leaders of the highest performing groups create a “culture of belief.” In these distinctive organizations, people believe in their leaders and in the organization’s vision, values, and goals. Team members are engaged, enabled, and energized (the authors use the term Three Es). 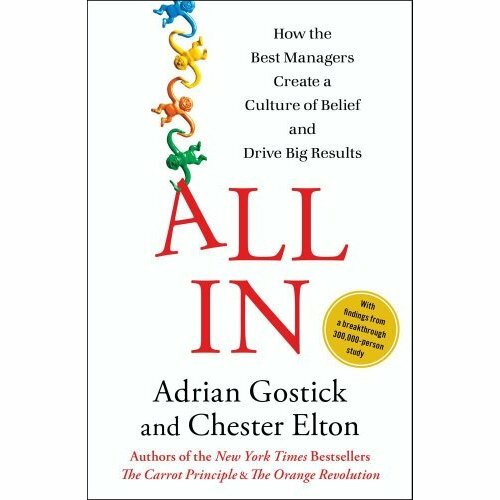 All In is a book about culture, but more than that it is the story of how great leaders create unique, inviting, and rewarding places to work – or serve. What about you – are you ready to lead all in? This entry was posted in BookNotes, Change, Leadership, Personal Development, Teamwork and tagged Adrian Gostick, All In, Chester Elton, Culture, culture of belief. Bookmark the permalink.